A light hearted week of Scottish and English folk dance with a friendly and experienced team. There are dance workshops each morning, with afternoons free for you to explore the sights this lovely area has to offer, or to relax and enjoy the Manor and grounds. Dances every night include a Scottish Ball, a ceilidh and a Costume Playford Ball, so bring costumes if you have them!! The week is aimed at dancers with some experience – of either English or Scottish dance – to explore a new dance style, or brush-up on existing dance skills. There will be opportunities to try both English and Scottish styles of dance, or to focus on one if you prefer. 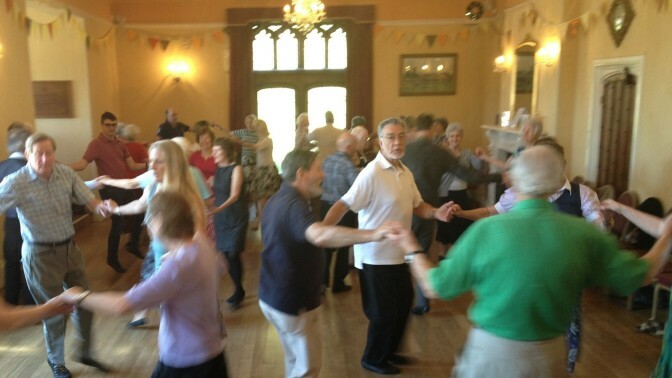 Ray Goodswen has been dancing and calling in the West Country for about 35 years. He is essentially a dancer with an enthusiasm to share his experience with others. He enjoys calling all types of dances from Playford to American contras. The hard work that is needed to dance well is made to feel easy and fun under his humorous but firm guidance and instruction. He strives to keep dancing alive and available to all dancers who want to extend their knowledge and pleasure of traditional dance. Kathy Lawmon is an experienced and accomplished teacher (and dancer!) of Scottish Country Dancing and Highland Dancing, and leader of the Southsea Reel Club. Stradivarious are Rod & Francis Stradling joined by Poppy Weatherall, to create music that you just have to dance to! Their repertoire covers all styles of English and Scottish dancing and a range of other types of dance. All are active dancers so they know what they like, and aim to provide an enthusiastic performance for dancers.